I would prefer to know, love, and become like Jesus just by sitting in a comfortable chair with a cup of tea and my Bible, or by spending hours praying for my family and reading a devotional book. But sometimes the path to knowing, loving, and becoming like Jesus includes pain. Over the past two and a half years, Mike and I have walked with our little granddaughter, Claire, and her parents, Matt and Anna, through Claire’s battle with leukemia. It has been one of the most painful and profound learning experiences of our lives. There has been so much that Claire has not been able to understand: the bitter tasting medicines, the unnerving visits to the clinic, the “pokes” (as she calls them) when nurses take blood samples. She has had to endure the surgical placement of a port for chemotherapy treatments. She’s always hated the spinal taps. And she’s had to persevere through the difficult side effects of chemo. As I’ve watched Claire struggle with this frightening illness, I’ve been reminded of Jesus’ call to become like little children (Matthew 18:3). 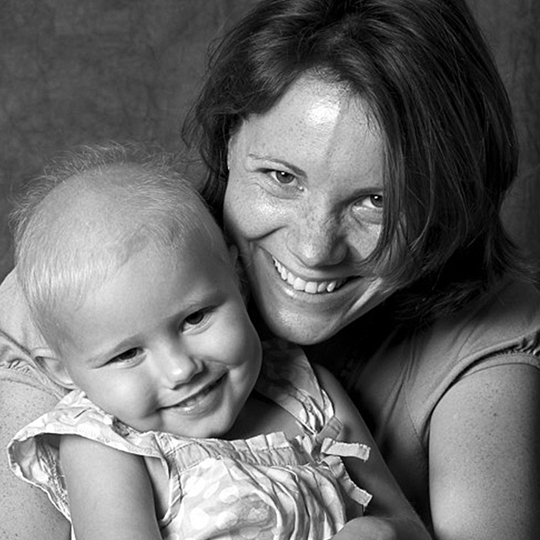 Throughout the treatments, Claire has trusted her mother. The greater her uncertainty or pain, the tighter Claire would cling to Anna. Claire did not understand why she had to take her medicine; she did it because mummy said so. She still does not like having “pokes” for her ongoing blood tests, but she holds Anna tight, closes her eyes so she doesn’t have to look, takes deep breaths, and courageously trusts what her mummy asks her to do. Whenever I have been with Claire and Anna at the clinic or hospital, I have leaned on Psalm 63:8 (which has become one of my favorite verses): "My soul clings to You; Your right hand upholds me" (NASB). My relationship with the Lord should be like that, clinging to Him through the painful, frightening, discouraging things of life. So, as our family’s journey with Claire demonstrates, the path to Christlikeness often passes through suffering. We continue to be concerned about what might be ahead. We realize that suffering is part of life, but I believe that we can choose to face suffering in a redemptive way, to join with Jesus in the fellowship of His suffering. Having that perspective changes everything. A letter from my brother, Peter, helped me to see the importance of my attitude. He pointed out that, in Philippians 3:10, Paul tells us about the power of a redemptive attitude in the face of suffering. Paul expressed what he wanted most in life when he said, "that I may know Him and the power of His resurrection and the fellowship of His sufferings, being conformed to His death . . ." (NASB). He considered other things to be worthless in comparison to knowing Jesus. He had decided what he wanted most in life—to know Jesus, even in His sufferings. This leads me to a question: What do I really want most in life? What do you want most in life? I don’t know about you, but I am not very keen on experiencing pain and hardship. But I know that life will bring its share of suffering, and eventually death; so, like Paul, I need to choose my attitude. Before my father died, when I was young, he taught me that in every situation I must choose one of three attitudes: I can choose to have a rebellious attitude, a resigned attitude, or a redemptive attitude. When we see suffering as a chance to walk with Jesus—to know the power of His resurrection and the fellowship of His suffering—then we can redeem the suffering and let it help us to grow in knowing, loving, and becoming like Jesus. Our attitude makes all the difference. God loves to demonstrate His strength through ordinary people: people who love Him, people who imitate Christ in the grind of daily life, people who share Christ with family and friends. Sometimes He works through people even when they pass through life’s storms—literally. On May 2, 2008, powerful cyclone Nargis made landfall in the Buddhist nation of Myanmar. With a storm surge that swept 40 kilometers inland, Nargis destroyed vast areas and killed as many as 138,000 people. 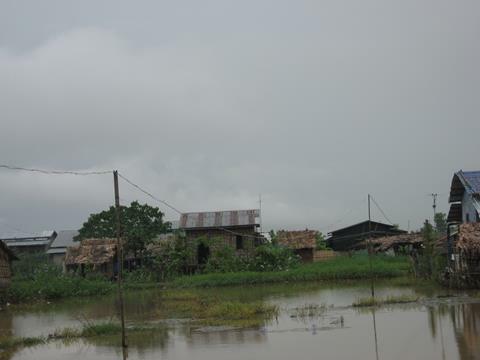 One poor village hit hard by the storm was home to a Christian man I’ll call Maung (to protect his identity). Maung was known in the village because he had been leading Bible discussions in his small house. That story began when a Navigator staff couple helped Maung’s great-niece to become a follower of Jesus. Then, about five years before the cyclone, she shared her faith with Maung. He surrendered his life to Christ and began to share his faith, gathering people in his home. Through Maung’s testimony, his family members started to come to the Lord one-by-one, including five sons and seven daughters. Today, Maung’s home continues to be the place where three generations of his family, plus about 20 friends, meet regularly for Bible discussions, prayer, discipleship classes, and singing. The Gospel has continued to spread beyond Maung’s village. One of Maung’s sons wants to open his home for others to know Jesus. Three of Maung’s sons have moved to another village where they are sharing their faith. Two of Maung’s grandsons are active witnesses among their college friends. Nearly 50 people are in the Kingdom because of God’s quiet work through Maung, including friends in nearby villages. God has been sustaining this group of believers in the midst of many hardships. Two of Maung’s sons died in work accidents, but the hope Jesus provided for Maung’s family was evident to the entire community. Earning a living has not been easy either. Some people in the group had been making trinkets, but business was slow. After much prayer, a large tourist agency in a nearby city liked the group’s work and hired them to provide an ongoing, large supply of tourist gifts. God is providing, and the non-believers in the community are noticing. This story demonstrates that the generational vision of The Navigators is not just a dream. What started with one person leading a friend to Christ in a village of Myanmar has resulted in more than three generations of followers of Jesus. Even through a devastating storm, God is working out His promises. It starts with a little seed that falls into the earth and dies. It then bears much fruit. Please pray for the Navigator work in Myanmar. May God continue to advance His Kingdom there, and also through the many ordinary Navigators around the world who carry the Gospel into their relational networks. Alan Ch’ng is an International Vice President. Before joining the International Executive Team, Alan led our Asia Pacific Region for more than six years. Alan and his wife, Connie, moved to Colorado Springs in April 2013. They have three grown sons. The eyes of millions of football fans all over the world will soon be focused on Brazil, the host of the 2014 World Cup. It’s bound to be one of the biggest news stories of the year. But there is another story happening in Brazil, one that won’t make the evening news. It’s the story of the Navigator ministry in Brazil, which began in the early 1960s when Ken and Carol Lottis and Jim and Marge Petersen moved their families to Brazil during a military coup. Despite many obstacles, God used them to bring a new generation of Brazilian university students to faith in Christ. These students graduated, scattered around the country, married, and built families while carrying the Gospel to friends and colleagues. Now a new generation of believers faces a dramatically different Brazilian culture. How, in twenty-first century Brazil, can the vision cast by the first generation be carried forward? How will this new generation model the Gospel among today’s unbelievers? What will help them continue to grow into mature disciples? Fortunately, the Scriptures provide guidance. Luke, writing Acts 11, records the story of the Gospel’s expansion geographically and ethnically from Jerusalem to Antioch. The way these first-century believers responded provides us with valuable insights for our contemporary challenges. In Acts 11:22-26 we see a vital function: the role of alongsiders. We see this crucial role modeled by Paul’s co-laborer, Barnabas. Studying the work of Barnabas helps us understand an important factor for sustaining a generational movement. What exactly did he do? He recognized and affirmed what God was doing among the believers. He encouraged people in their relationships with God. He served as a ligament, connecting people and resources. He taught from the Scriptures, protecting sound doctrine. He provided an example of Christlike character. Almir and Mitzi Pigari, a couple serving as alongsiders in Brazil, are good examples of what Barnabas demonstrated in his life. Almir and Mitzi stand by their friends in personal ways, supporting, teaching, and connecting. Almir and Mitzi travel around Brazil to encourage groups in numerous cities. For example, they drive about 300 kilometers once a month to spend a weekend with young professionals in São Paulo, helping them integrate the Gospel with work and life in a city of 20 million people. Mitzi’s role is crucial. As an experienced mother and wife, she is able to counsel and encourage the younger women in the struggle to balance work and raising children. In all this, Almir believes that they have one primary role: to encourage people to stay focused on an intimate relationship with Jesus. “If they remain in Jesus, they will be fruitful. Without that focus, it’s easy for us to be consumed by the world and to lose perspective,” Almir told me. I give thanks to God for the many alongsiders like Almir and Mitzi in Brazil who have sustained the Navigator movement over three generations. I encourage you to watch a short video about the Navigator work in Brazil, which features Almir and Mitzi, at this link. Mike Shamy was born in New Zealand. Mike and his wife, Audrey, became Navigator staff in 1980. From 1989 to 1996 Mike led and coached ministries in New Zealand. In 1999 he led the U.S. Metro Mission. In 2004, Mike joined the International Executive Team and is the link person for Latin America. Raul Ortiz, the Navigator Regional Director for Latin America, describes Northwestern Mexico as a place in desperate need of the Gospel. Although it is predominantly Catholic (like the rest of Mexico), it is rapidly becoming secular. Divorce rates are rising. Drug-related crime is often in the news. The economy is, in some cities, stagnant. All this creates despair in the hearts of people. God’s transforming grace and love need to penetrate these circumstances to bring healing and renewal. The Latin American Navigators have initiated a new effort to love, serve, and embrace people in this part of Mexico, specifically in four states: North and South Baja California, Sinoloa, and Sonora. The “launching pad” for this effort now resides in Culiacán, in the state of Sinoloa, where one Navigator couple has already developed a strong group of believers. In 2014, Mexican Navigators will make survey trips into the region’s three additional states, looking for God’s leading in cities such as Tijuana (near the U.S. border), La Paz, and Hermosillo. Raul said that the team is asking God for additional laborers, including people from outside Mexico. They are asking that God would establish a thriving, spirit-filled group of believers in each of the region’s major cities. Please pray every day over the next three months for Northwestern Mexico, that God would open doors, send more workers, provide financial resources, and give strength and courage to a new team of pioneers.